The goal of Indian education from the 1880s through the 1920s was to assimilate Indian people into the melting pot of America by placing them in institutions where traditional ways could be replaced by those sanctioned by the government. Federal Indian policy called for the removal of children from their families and in many cases enrollment in a government run boarding school. In this way, the policy makers believed, young people would be immersed in the values and practical knowledge of the dominant American society while also being kept away from any influences imparted by their traditionally-minded relatives. Seeking to educate increasing numbers of Indian children at lower cost, the federal government established two other types of schools: the reservation boarding school and day schools. Reservation boarding schools had the advantage of being closer to Indian communities and as a result had lower transportation costs. Contact between students and their families was somewhat restricted as students remained at the school for eight to nine months of the year. Relatives could visit briefly at prescribed times. School administrators worked constantly to keep the students at school and eradicate all vestiges of their tribal cultures. Day schools, which were the most economical, usually provided only a minimal education. They worked with the boarding schools by transferring students for more advanced studies. In the Pacific Northwest, treaties negotiated with the Indians during the 1850s included promises of educational support for the tribes. For example, Article 10 of the Medicine Creek Treaty signed by members of the Nisqually, Squaxin, Puyallup and Steilacoom Tribes on December 26, 1854 called for the establishment of an agricultural and industrial school "to be free to the children of said tribes for a period of 20 years." The expenses of the school, its employees and medical personnel were to be defrayed by the federal government and not deducted from annuities. A similar clause appears in the Treaty of Point Elliott, signed by representatives of tribes living in the central and northern Puget Sound region. The promised schools did not come into existence for several years. In the 1870s and 1880s a few small reservation boarding schools were established on the Chehalis, Skokomish and Makah Reservations. These institutions, which had fewer than 50 students, were all closed by 1896 and replaced by day schools. In Tacoma, a one-room shack served as a day school for young Puyallup Indians beginning in 1860. By 1873 students had begun boarding at the school and during the 1880s enrollment increased to 125 pupils. At the turn of the century, Cushman Indian School had become a large industrial boarding school, drawing over 350 students from around the Northwest and Alaska. The 1901 Report of Superintendent of Indian Schools praised Cushman for being well equipped for industrial training and photographs show a modern machine shop. Cushman remained one of the largest on reservation boarding schools in the region until it closed in 1920. Meanwhile, on many reservations missionaries operated schools that combined religious with academic training. At Priest's Point near the Tulalip Reservation, Reverend E.C. Chirouse opened a school in 1857 for six boys and five girls. By 1860 he had 15 pupils and the school continued to grow under the auspices of the Sisters of Providence. At these missionary run schools, traditional religious and cultural practices were strongly discouraged while instruction in the Christian doctrines took place utilizing pictures, statues, hymns, prayers and storytelling. Some missionary schools received federal support, particularly at times when Congress felt less inclined to provide the large sums of money needed to establish government schools. The Tulalip Mission School became the first contract Indian school, an arrangement whereby the government provided annual funds to maintain the buildings while the Church furnished books, clothing, housing and medical care. 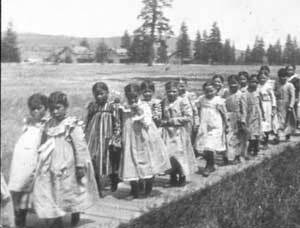 In 1896 Congress drastically reduced the funding for mission schools and eventually, in the winter of 1900-01, the Tulalip school became a federal facility. The old school buildings were destroyed by fire in 1902. On January 23, 1905, exactly fifty years after the signing of the Point Elliott Treaty, a new and larger school opened along the shores of Tulalip Bay. The Tulalip Indian School began under the supervision of Charles Milton Buchanan, a physician who also served as Indian Agent for the reservation. The first year it had only one dormitory, but by 1907 both girls' and boys' buildings were completed and the school had a capacity enrollment of 200 students. The children ranged in age from 6 to 18 years and came from many different reservations as well as some off reservation communities. It was not uncommon for teachers at day schools to recommend certain students for the boarding school. Because Tulalip offered a maximum of eighth grade education, some students transferred to Chemawa for more advanced training. In eastern Washington, a U.S. military fort near Spokane was transformed into a boarding school for Indians of the Spokane and Colville reservations. Fort Spokane Boarding School opened in 1900 with an enrollment of 83 pupils and grew to 200 by 1902. It operated only until 1914 after which time the children attended day schools closer to their homes. Similarly, the military facility at Fort Simcoe became a school for the Yakama and their neighbors. The national system of Indian education, including both off reservation boarding schools, reservation boarding schools and day schools, continued to expand at the turn of the century. In the Pacific Northwest, Chemawa Indian School became the largest off reservation boarding school and drew pupils from throughout the region and Alaska. Chemawa had originally been located at Forest Grove, Oregon, but was moved to Salem in 1885 after officials determined that the original site lacked adequate agricultural land. By 1920 Chemawa enrolled 903 students from 90 different tribes, nearly a third coming from Alaska. All federal boarding schools, whether on or off reservation, shared certain characteristics. The Bureau of Indian Affairs issued directives that were followed by superintendents throughout the nation. Even the architecture and landscaping appeared similar from one institution to the next. Common features included a military style regimen, a strict adherence to English language only, an emphasis on farming, and a schedule that equally split academic and vocational training. By reading the Reports of the Commissioner of Indian Affairs and other documents you can compare the official reports submitted by various schools. A typical daily schedule at a boarding school began with an early wake-up call followed by a series of tasks punctuated by the ringing of bells. Students were required to march from one activity to the next. Regular inspections and drills took place outdoors with platoons organized according to age and rank. Competitions were held to see which group could achieve the finest marching formation. The foremost requirement for assimilation into American society, authorities felt, was mastery of the English language. Commissioner of Indian Affairs T.J. Morgan described English as "the language of the greatest, most powerful and enterprising nationalities beneath the sun." Such chauvinism did not allow for bilingualism in the boarding schools. Students were prohibited from speaking their native languages and those caught "speaking Indian" were severely punished. Later, many former students regretted that they lost the ability to speak their native language fluently because of the years they spent in boarding school. The boarding schools had what came to be called the "half and half" system where students spent half of the day in the classroom and half at a work assignment or "detail" on the school grounds. The academic curriculum included courses in U.S. history, geography, language, arithmetic, reading, writing and spelling. Music and drama were offered at most schools. 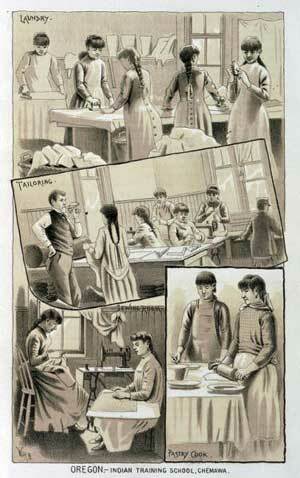 Young women spent either the morning or the afternoon doing laundry, sewing, cooking, cleaning and other household tasks. Older girls might study nursing or office work. 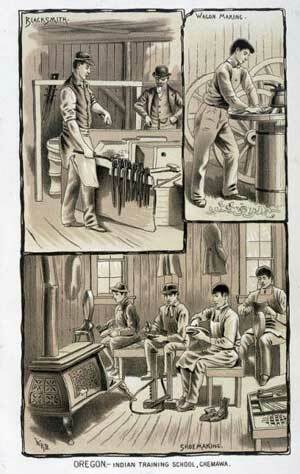 The young men acquired skills in carpentry, blacksmithing, animal husbandry, baking and shop. They chopped firewood to keep the steam boilers operating. The work performed by students was essential to the operation of the institution. The meat, vegetables and milk served in the dining room came from livestock and gardens kept by the students. The girls made and repaired uniforms, sheets, and curtains and helped to prepare the meals. Illness was another serious problem at the boarding schools. Crowded conditions and only the basic medical care no doubt contributed to the spread of diseases such as measles, influenza and tuberculosis. Tuberculosis was especially feared and at the Tulalip Indian School the dormitories were kept cold by leaving the windows open at night. Several students were sent to sanitariums in Idaho or Nevada. In a letter issued to superintendents in 1913, the Indian Office advised disinfecting all textbooks at the end of each school year to reduce the chance of spreading disease. Hospital reports for Tulalip indicate that boys spent a total of 110 days in the hospital during one month and girls 125 days. Death was not an unknown occurrence either. At Chemawa, a cemetery contains headstones of 189 students who died at the school, and these represent only the ones whose bodies were not returned home for burial. Not all experiences at the boarding schools were negative for all students. In hindsight, former students acknowledge benefits they gained from their education, and there were happy moments for some. Sports, games and friendships are examples of experiences remembered in a positive light. By the 1920s the Bureau of Indian Affairs had changed its opinion about boarding schools, responding to complaints that the schools were too expensive and that they encouraged dependency more than self-sufficiency. By 1923, the majority of Indian children nationwide attended public schools. A report on Indian education issued in 1928 revealed glaring deficiencies in the boarding schools, including poor diet, overcrowding, below-standard medical service, excessive labor by the students and substandard teaching. The 1930s witnessed many changes in federal Indian policy, among which was a shift in educational philosophy. Classroom lessons could now reflect the diversity of Indian cultures. States assumed more control over Indian education as more children enrolled in public schools. Most of the boarding schools were closed by this time, Tulalip in 1932 and Cushman in 1920, leaving Chemawa as the sole government boarding school remaining in the Pacific Northwest. Cushman Indian School, Tacoma, Wash.
8:00 Industrial work begins. School detail at liberty. The use of this period is at pupils' discretion. The more studious at books; those inclined to athletics make use of this time for practice. Some pupils practice music lessons, etc. 3:30 School dismissed. School detail at liberty. Time spent in same general manner as morning detail utilizes period from 8:00 to 8:50. 1. Harper's Weekly, v.26 (no. 1327), May 27, 1882: 324 (illus. ), 327 (text). 2. Curriculum records from National Archives and Records Administration, Pacific Northwest Region, RG75, Box 321: Tulalip Agency. 3. Correspondence from National Archives and Records Administration, Pacific Northwest Region, RG75, Box 321: Tulalip Agency. Adams, David Wallace. Education for Extinction: American Indians and the Boarding School Experience, 1875-1928. Lawrence: University Press of Kansas, 1995. Bonney, W.P. "Puyallup Indian Reservation," Washington Historical Quarterly (1928) v. 19, no. 3: 202-205. Cheeka, Joyce Simmons as told to Werdna Phillips Finley. As My Sun Now Sets. Unpublished autobiographical memoirs. Coleman, Michael C. American Indian Children at School, 1950-1930. Jackson: University Press of Mississippi, 1993. Collins, Carey C. "Oregon's Carlisle: Teaching 'America´ at Chemawa Indian School," Columbia: The Magazine of Northwest History, Tacoma: Washington State Historical Society, Summer 1998. Collins, Carey C. "Through the Lens of Assimilation: Edwin L. Chalcraft and Chemawa Indian School," Oregon Historical Quarterly v. 98, no. 14 (Winter 1997-98): 390-425. History of Cushman School. Typescript in Special Collections Division of the Washington State Historical Society, n.d.
Hoxie, Frederick E. A Final Promise: The Campaign to Assimilate the Indians. Omaha: University of Nebraska Press, 1984. Report of the Superintendent of Indian Schools, (1897/98-1903/04). Washington: U.S. Government Printing Office. Reports of the Indian Commissioner, Annual Reports of the Department of the Interior, various dates. Washington: U.S. Government Printing Office. The Suquamish Museum. The Eyes of Chief Seattle. [Suquamish, Wash.], 1985. 1928-1973. Albuquerque: University of New Mexico Press, 1974. Cheney Cowles Museum, Eastern Washington Historical Society. They Sacrificed for Our Survival: The Indian Boarding School Experience. Exhibit produced 1997, available for travel. The Tulalip Tribes. 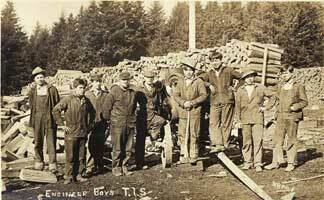 Between Two Worlds: Experiences at the Tulalip Indian School, 1905-1932. Exhibit produced 1992, available for travel. For a typical journalist's description of a boarding schools, see "The Indian School at Chemawa," West Shore, v.13 (Jan. 1887): 5-18. Examine the photographs from several different boarding schools (for example Tulalip, Cushman, Chemawa, Fort Spokane, Fort Simcoe, Fort Lapwai) and consider the similarities and differences that you can see. Also, search for additional photographs of Catholic mission schools (for example St. Mary's in Omak, Washington or Sacred Heart in DeSmet, Idaho). Make a list of these factors and speculate as to why some things look the same and others look different (for example emphasis on farming, uniforms, appearance of buildings, environment and appearance of students). What other sources of information could you look for to compare the schools? What type of work did the students perform at the boarding schools? Which jobs were assigned to boys and which to girls? Look at the photographs for clues. Did these students work harder than young people today? What would they learn from their daily jobs? Do you think these work assignments helped them after they left school? There are many things that photographs of the boarding schools do not tell us. Can you think of some? Who was taking the pictures and for what reason(s)? How does this affect what we can learn about the schools? What are some other sources from which we can learn more about the boarding school experience? Do you think that the federal government accomplished its goal of assimilating Indians into American society? Why or why not? Is it likely that a person's cultural background can be totally erased? What aspects of your own culture do you feel most connected to? Why do you think the educators stressed vocational or work-related training over academic or book learning? Was there a built-in prejudice against Indian students evident in this curriculum? What do you think self-determination means and how does it differ from the philosophy of the boarding schools? Carolyn J. Marr is an anthropologist and photographs librarian at the Museum of History and Industry in Seattle, Washington. She has worked with the Chehalis, Suquamish, Tulalip and Makah Tribes on projects relating to photographs and oral history as well as material culture, especially basketry and textiles. Several exhibits have resulted from her work, including one on the boarding school experience in western Washington. Publications include, "Portrait in Time: Photographs of the Makah by Samuel G. Morse, 1897-1903," and numerous articles in Pacific Northwest Quarterly, Columbia Magazine and other journals.